Lumbar discography developed as a complementary modality for studying the lumbar intervertebral discs at a time when oil-based myelography was associated with high false-negative rates, particularly at the lumbosacral junction. Radiographic contrast was first injected into a normal disc in 1941 by Lindgren in Scandinavia. In 1948, Knut Lindblom, a radiologist in Stockholm, Sweden, was the first to publish in vitro studies on discography by using a posterior transdural approach and coined the term discography (2). 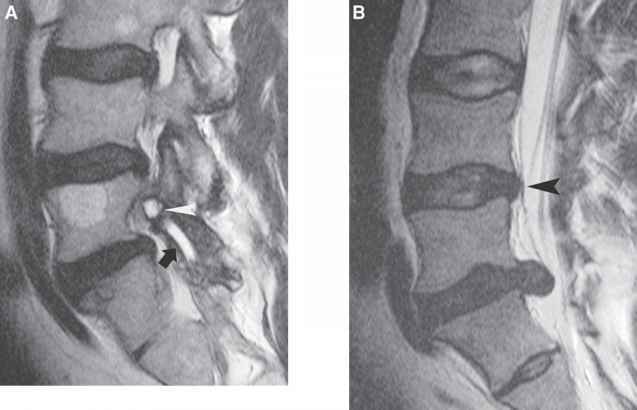 Also in 1948, Karl Hirsch employed the procedure to identify painful discs in patients with radiculopathy. Hirsch's diagnostic parameter of the procedure was the pain response, which led to the concept of provocative discography (3). Lindblom continued to modify the technique to utilize the injection of contrast to visualize the radial structures of the disc, and the diagnostic criteria were expanded to include the radiographic appearance of the disc as well as the patient's response to the injection (2). At the Cleveland Clinic, Wise and Weiford were the first in the United States, in the early 1950s, to visualize and study internal disc morphology (4). Cloward and Busade continued the work and described the technique and indications for discography in their 1952 paper on the evaluation of normal and abnormal disks (5). Ulf Fernstrom suggested mechanical and biomechanical causes for symptoms, based on cases of back and leg pain in which no nerve compression was detectable (6). Fig. 1. (A) Sagittal T2 MRI showing fluid in the facet joint (dark arrow) and a synovial cyst (white arrowhead). 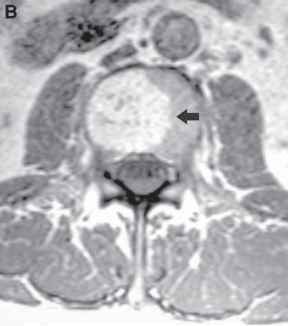 (B) Sagittal T2 MRI showing a large disc herniation at L5-S1 and disc desiccation and a disc bulge at L4-5 (arrowhead). This represents some of many potential pain generators in the spine. zero rate of false-positive results in 10 asymptomatic volunteers (8). Walsh incorporated fluoroscopy and postdis-cography computed tomography (CT) scanning that helped establish the standards of modern-day discogra-phy (8). Largely as a result of the development of CT and magnetic resonance imaging (MRI), the primary purpose of discography today is for documentation of the disc as a pain source (9,10).